This chapter begins with the observation that although most advocates of mainstream thinking in psychology readily acknowledge that a statistical index used to represent a group as a whole cannot be taken to represent accurately every individual in the group, they have yet to come to terms with the fact that, actually, such a statistical index cannot be taken to represent any individual in the group. The remainder of the chapter is devoted to making clear what is conceptually problematic about various interpretive/discursive practices within the mainstream that obscure this reality and, in the process, sustain the mistaken belief that statistical knowledge of aggregates of individuals does convey some knowledge of the individuals within those aggregates. Examined critically are prevailing understandings of (a) the meanings of correlations between variables marking differences between individuals, (b) the prediction and explanation of individual psychological doings, and (c) claims to probabilistic knowledge about individuals. In this latter connection, note is taken of the failure of mainstream thinking to respect the distinction between frequentist and subjectivist understandings of probability. 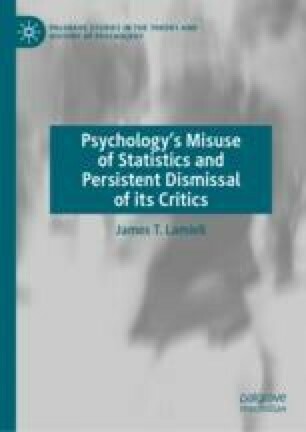 The chapter concludes by reiterating the need for genuinely paradigmatic changes in the investigative practices of mainstream psychologists.